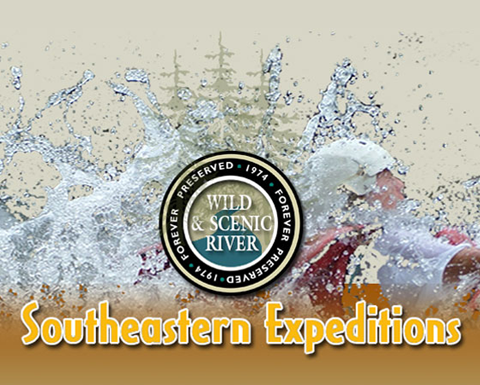 Founded in 1972 as one of the first whitewater rafting outfitters in the southeast, Southeastern Expeditions was the pioneer in whitewater rafting in the Southern U.S. We set the standard for the rest of the East Coast to follow. Southeastern Expeditions opened its doors in 1972 with equipment purchased from Warner Brothers following the filming of the movie Deliverance. Claude Terry, the founder of Southeastern Expeditions, was even used as a consultant and stunt double in the movie. Who can resist a company with ties to Burt Reynolds, Jon Voight and Ned Beatty! Our staff is composed of experts. All guides, receptionists and drivers have had excellent training and many have had years (some decades) of experience. These folks are friendly, knowledgeable and know where to direct you to make your vacation that much more enjoyable. Our management has come up with many packages at great deals for making your experience as easy and hassel free as possible. We suggest that you pick your package and leave all the details to us and our team of experts while you enjoy the excitement of our outdoor adventures. Southeastern’s Chattooga River guides are some of the best anywhere. All guides have a minimum of basic CPR and first aid, while many have advanced first aid training. All guides on the river have extensive training, while kayak instructors are experts in their fields. They know people, too. They’re friendly, open, and approachable. 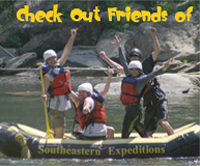 Most of our Chattooga Rafting customers are repeat guests or were referred by a past Southeastern Expeditions customer. With such a high return rate, we think our customer satisfaction is top rate! Though our season does end in late fall, our staff works year-round to bring you the highest quality adventure for the following year. We are committed to bettering our product each year to keep you coming back! with Ocoee Adventure Center. Ocoee whitewater rafting, mountain biking, kayak instruction & lake tours. on the TENNESSEE RIVER with Blue Moon Cruises. Luxurious and relaxing 3 1/2 hour eco-cruises through the Tennessee River Gorge aboard our 70 ft yacht. with Ocoee Adventure Travel, specializing in Costa Rica Adventure trips and eco-tours. Shop for unique gifts at Mother Nature's gift shop on the Ocoee River. Copyright © 2018 by Southeastern Expeditions. All Rights Reserved.